The whole team are so pleased about the enormous success of our lovely client, Claire and her Notting Hill based tea lounge, Lakwatsa. Lakwatsa opened its doors at the end of November last year, hosting a wonderful press day. Some of the UK’s most influential foodie bloggers attended the opening where they got to sample a range of Lakwatsa’s delicious bubble tea and merienda menu. After seeing for themselves just what a great location Lakwatsa is to kick back and unwind, the glowing reviews came flooding in. 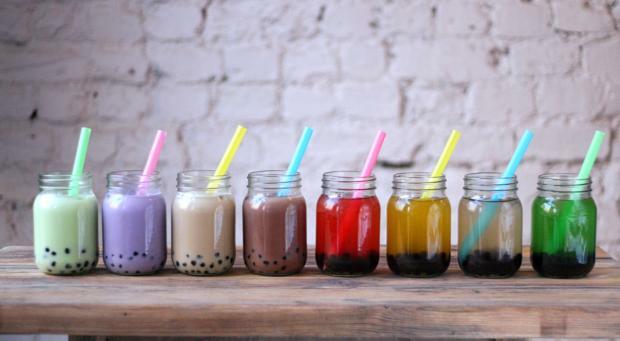 Lakwatsa has been featured in publications such as Marie Claire, ShortList, Time Out, the Evening Standard and Scout London, even being called ‘a bubble tea version of Starbucks’. Our favourite tea lounge has gone from strength to strength in the couple of months since it has opened. Every Sunday Claire’s team features a delicious new Filippino recipe and the delicious merienda and bubble tea frequently sell out because of their popularity. Lakwatsa’s interior, which was designed by the team here at ‘i-am’, is a stylish and relaxing place to socialise. Featuring swing seats strewn with cushions and stripped back wood, guests can make use of the free Wi-Fi service, charge their laptop or phone in the power sockets located by every seat and choose what they want to listen to from Lakwatsa’s interactive music playlist. If you haven’t discovered it yet, make sure you get on down to visit Lakwatsa in Notting Hill and see what all the fuss is about. You wont be disappointed! Need branding help or advice? Want to speak to experts in graphic and interior design? Or if you’re interested in hearing how ‘i-am’ can help you and your business? Get in touch!